Pranayama – the control of breath- There is an extremely urgent need to teach how to do Pranayama during Sandhyavandana. Pranayama is a part of daily rituals of a Brahmin.Loosely the priest tells the Brahmin (Mookai pidiyungo” meaning catch the nose. 90% of the people hold all their fingers in the form of a cone and touch the tip of his nose. (There is a joke.When an NRI wastold like this by the Vadhyar , it seems he caught the nose of the Vadhyar). 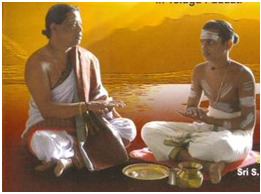 I am giving below a very broad method of Pranayama with Manthra along with its benefits . 1.Pranayama techniques are beneficial in treating a range of stress related disorder. 2.Pranayama improves the autonomic functions. 3.It helps relieving the symptoms of asthma. 4.It reduces the signs of oxidative stress in the body. 5.Practicing pranayama everyday can assist in steady mind, strong will power and sound judgement. 6.Regular pranayama can extend life and enhance ones perception of life. A Brahmin doing twice SAndhya Vandana and Once Madhyaheeka has to do this Pranayama 36 times, If done properly, it would clean his lungs, it would give him great peace of mind and make him overall healthy. I am grateful. Yes, I shall take more interest in this.never too late ! I am running 87 only !